The Baal Shem Tov's synagogue. The following text was prepared by Rabbi Schochet as material for a lecture series on the Baal Shem Tov, for Jewish.tv, the video site of Chabad.org. Rabbi Schochet—who passed away on Shabbat, the 20th of Av 5773, July 27, 2013—did not finish filming the series. The Baal Shem Tov (lit. “Master of the Good Name”) was and remains a unique personality in Jewish history. His teachings touched the entire Jewish nation, scholarly and unlearned alike. To understand the depth of his impact, we first need to understand the historical context of the Chassidic movement he founded. The Baal Shem Tov was born on the 18th of Elul 5458 (1698), in during a most difficult time in Jewish history. The century prior to his birth was one of great upheavals. Persecutions of Jews in Eastern Europe were quite common, bringing much suffering. Tumultuous times always raise Messianic speculation; moreover, mystical texts suggested that the year 1648 would be a very special year, which was interpreted by many as a prediction of Messianic redemption. That year was indeed special, but not in the anticipated joyous way – on the contrary. The Thirty-Year War had just ended in Europe, leaving chaos in its wake. A ruthless Ukrainian leader, the notorious anti-Semite Bogar Chmielnicki, took advantage of this chaotic time and led his gangs in murderous attacks against Jews and Jewish settlements. Historians estimate that they cruelly slaughtered around 200,000 Jews. This event became known in Jewish history as gezerat Tach-Tat, the tragedy of 1648-1649. As if that was not enough, right afterward, war broke out between Poland and Sweden. During the war, numerous Jews were again killed in cold blood by the Polish general Czarnikl. These tragedies significantly escalated the Messianic fervor among the Jews of Eastern Europe. Then, in 1665, a man in Greece by the name of Shabbtai Tzvi proclaimed himself to be the long-awaited Messiah. There have been a number of other false messiahs in Jewish history, but hardly anyone else gained as great a following as he did. Shabbtai Tzvi’s movement spread from the Middle East to Europe. Initially, prominent rabbis were drawn to him, even while other rabbis denounced him. In a kind of mass-hysteria, myriads of Jews sold everything they had in anticipation of moving to the Holy Land to enjoy the bliss of the Messianic age. Even after Shabbtai Tzvi was arrested by the Turkish authorities and converted to Islam to save his skin, many of his followers remained faithful to him, assuming that his apostasy was some kind of ruse. In the end, innumerable Jews throughout Europe were left not only disillusioned, but also destitute, materially and spiritually. Those were terribly sad and dark days. Torah scholars found comfort in pursuing their studies in the yeshivah or bet hamidrash, in spite of the rampant poverty. But the masses were left to their own devices, like ships without rudders. In fact, there was a great divide between the scholarly elite and the simple Jews, who were too poor to devote much time to learning. In addition to the scholarly elite and the poor working Jews, there existed another, special group, which formed a bridge between the other two. These were mystics, scholars who studied the Kabbalah, but they were very concerned about the welfare of their fellow Jews. They would disguise themselves as simple folk and wandered from village to village, subsisting on bare necessities. This voluntary exile, called in Yiddish oprichten golus, was intended as a kind of atonement for the Jewish nation. Some of these mystics organized and undertook a special task – to bring comfort to the devastated masses, encourage their religious faith and practices, and help them out as much as they could both spiritually and materially. They became known as the tzadikim nistarim, anonymous holy men. Israel, know and remember throughout your life, that the Almighty G‑d is always with you. Remember not to fear anything and anyone except for your Father in Heaven! And remember, also, to love from the very core of your heart every single Jew, regardless of who or what he is! The orphan became the ward of the local community, which tended to all his needs out of reverence for his saintly father. After a few years, a group of tzadikim nistarim adopted Israel and taught him Torah, including the mystical tradition. While still a teenager, he became involved in the activities of the group and eventually became its leader, initiating new efforts to encourage Jewish faith, practices, and Torah knowledge among the simple Jews. At a time when Rabbi Israel was earning his living as a schoolteacher, a prominent man named Reb Ephrayim happened to come to his village to settle a personal dispute with a local resident. The two decided to have the local teacher, Rabbi Israel, arbitrate, which he did to mutual satisfaction. Reb Ephrayim was deeply impressed by this young teacher and suggested that Rabbi Israel marry his daughter. Rabbi Israel agreed, and together they signed a document to that effect. Shortly thereafter, Reb Ephrayim passed away. His son, Rabbi Avraham Gershon of Kitov, headed a rabbinic court in Brody, the major Jewish center in Galicia and was highly regarded as a great Talmudic scholar and Kabbalist. After his father’s passing, Rabbi Avraham Gershon found the agreement his father had signed with an unknown Israel ben Eliezer, but, not recognizing the name of the intended bridegroom, did not know what to make of it. A short while later, a simple person dressed in rags appeared in Rabbi Avraham Gershon’s court. The rabbi thought him to be a beggar and offered him a donation, but the stranger said he wanted to see him privately about an important matter. When they retired to a room, the stranger, Rabbi Israel, took out his copy of the marriage agreement and said he had come to collect his bride. Needless to say, Rabbi Avraham Gershon was shocked. What had his father done? He tried to convince Rabbi Israel to forego the commitment, but without success. The only concession the stranger was willing to make was to meet with Rabbi Avraham Gershon’s sister and leave the decision to her. When Rabbi Israel and the girl met privately, he revealed to her who he really was, but asked that she keep his identity a secret. She agreed to the condition, and informed her brother that she consented to the match. There was nothing more the rabbi could do to prevent the marriage, and the couple were wed. The rabbi, deeply embarrassed by his apparently simple and ignorant new brother-in-law, set them up in a nearby village. For the next few years, Rabbi Israel continued his studies in full anonymity, while his wife worked to support them. Several years later, the Baal Shem Tov revealed his true identity to his brother-in-law, and Rabbi Avraham Gershon became one of his foremost disciples. As mentioned earlier, the Baal Shem Tov’s first teachers were the wandering mystics who adopted him. Thereafter, he immersed himself in Talmudic and Kabbalistic studies, including manuscripts of mystical teachings that were passed on to him by the leader of the tzadikim nistarim. At the age of 26, already a great scholar, he had an extraordinary experience. Many mystics have reported having contact with departed souls. There are numerous stories going back as far as the Talmud and Midrash of saintly individuals to whom the biblical prophet Elijah appeared. Similarly, the Baal Shem Tov stated that the biblical prophet Achiyah Hashiloni appeared to him on his 26th birthday and taught him the secrets of the Torah over the course of ten years, as attested by his disciples. In 1734, when the Baal Shem Tov reached the age of 36, his new master told him that the time had come to reveal his true identity to the world. This date marks, in effect, the founding of the Chassidic movement. The Baal Shem Tov also put a high value on joy, encouraging the Jews to rejoice in the fact that they are the people chosen by G‑d and blessed with the Torah. Often he told stories and parables that held profound moral values and inspiration. Wherever he went, people were drawn to him and deeply inspired. He literally revived their spirits, prompting them to make a greater commitment to Torah and mitzvot. Many scholars, too, were drawn to the Baal Shem Tov’s teachings. Some of the greatest rabbis of the time were so impressed by him that they became his disciples. Among them were the aforementioned Rabbi Avraham Wherever he went, people were drawn to himGershon of Kitov; Rabbi Yaakov Yosef, the rabbi of Sharigrod and later Polnoy, who incorporated many of the Baal Shem Tov’s teachings in his writings; Rabbi Meir Margolius, chief rabbi of Ostroha and author of the responsa Meir Nesivim; Rabbi Dov Ber, the Maggid of Mezritch, who became the Baal Shem Tov’s successor as head of the Chassidic movement; Rabbi David Heilperin, rabbi of Ostroha and later Zaslov; Rabbi Israel Charif, rabbi of Satanov and author of Tiferet Yisroel; Rabbi Yosef Yoel Heilperin, rabbi of Stefan; and so forth. The Baal Shem Tov had some 60 primary disciples who passed on his teachings to others. Eventually the Baal Shem Tov settled in the city of Mezhibush, though even then he continued to make many journeys. As his fame grew, many came to hear his teachings and to be inspired, and many more came to receive his blessings and advice. Those seeking his help were not only Jews, but also gentiles who heard about this miracle-working saint. In recently discovered civil archives and tax records of Mezhibush, the Baal Shem Tov is mentioned in records dating back to 1742, identified as “Baal Shem Doktor,” living in a tax-exempt house of the community. Not everyone was pleased with the fledgling movement. Many rabbis and community leaders viewed Chassidism as revolutionary and dangerous. They were afraid that the vast, popular appeal of Chassidism would threaten their authority. They were also concerned that the movement would endanger the fundamental Jewish value of Torah study and scholarship, due to the Chassidic emphasis on unqualified love for every Jew, regardless of his status in Torah learning. No less dangerous in their eyes were the mystical Chassidic teachings themselves. In the context of the recent, traumatic episode of Shabbtai Tzvi and his followers, who used a lot of distorted teachings of the Kabbalah to further their goals, a movement that made this secret wisdom public was regarded with extreme suspicion. Some thought that the new Chassidism was a branch of the Shabbatean movement. Though these fears were altogether unfounded, many rabbis and community leaders issued proclamations of denunciation against the Baal Shem Tov and his followers. The Baal Shem Tov himself, when directly confronted, would respond by refuting these charges, but did not allow himself to be drawn into public arguments and fights. To him, it was more important to spread light and comfort. The Baal Shem Tov continued to teach and inspire, and he saw much success during his lifetime. He carried on his efforts until the sixth of Sivan, the first day of the festival Shavuot, in the year 5520 (1760), when his soul returned to its Maker. He passed away in Mezhibush and was buried there; his gravesite is a place of pilgrimage to this day. The Baal Shem Tov’s work was carried on by his disciples, who spread his philosophy far and wide in their writings and teachings. The Baal Shem Tov left two children. His son, Rabbi Tzvi, became his interim successor for one year, until the leadership was passed on to Rabbi Dov Ber, the Maggid of Mezritch. 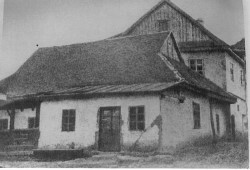 Rabbi Tzvi did not lead a Chassidic court and eventually moved to Pinsk, the city of his in-laws, where he passed away in 1780. His three sons, however, all became Chassidic leaders. The Baal Shem Tov also left a daughter, Odel, who married Rabbi Yechiel Ashkenazi and had three children. The first, Rabbi Moshe Chaim Ephrayim, was born in the 1740s and spent his formative years in the presence of his grandfather, the Baal Shem Tov. He authored one of the basic Chassidic texts, Degel Machaneh Ephrayim, in which he cites many teachings from his grandfather. Odel’s second son, Rabbi Boruch of Mezhibush, was born several years after his brother. An anthology of his teachings appeared under the title Butzina Dinehura. Both Rabbi Mosheh Chaim Ephrayim and Rabbi Boruch are buried near the Baal Shem Tov. Odel’s third child was a girl named Feiga. She married Rabbi Simchah, the son of one of the Baal Shem Tov’s early disciples, Rabbi Nachman of Horodenka, and they were the parents of the famous Chassidic leader, Rabbi Nachman of Bratslav. The Baal Shem Tov, like many scholars and luminaries before and after him, did not write any books. It has been rightly noted that he “created souls and not books.” A great number of his teachings were recorded by his disciples and published in special anthologies. The earliest and most famous of these are: Tzavo’at Horivash, first published in 1793; and Keter Shem Tov, a book in two parts based on the works of Rabbi It has been rightly noted that he “created souls and not books"Yaakov Yosef of Polnoy, first published in 1794. More recently, Sefer Baal Shem Tov, published in 1938, is a comprehensive anthology based on over 200 Chassidic texts and manuscripts. Chassidism is based on the mystical tradition of Judaism, the Kabbalah, and in particular its dominant school, the teachings of Rabbi Isaac Luria, known as the Arizal. The first dimention, peshat, is the simple, literal meaning of the Written Torah. However, peshat is not really so simple, as its meaning and directives are often difficult to understand. Torah shebe’al peh, the Oral Torah, explains and clarifies the peshat. The Oral Torah is the oral tradition that Moses received along with the Written Torah, which explains the applicable meaning of the mitzvot and was ultimately recorded in the Talmud and Midrash. The peshat is elaborated on by means of remez, teachings of the Torah which are merely alluded to in the actual text, and derush, teachings of the Torah which are derived by authoritative hermeneutical methods. These three parts, peshat—remez-derush, relate to the exoteric dimension of the Torah. As the word of G‑d, however, every commandment, story, and nuance in the Torah contains a much deeper meaning that is not at all obvious in the actual text or its hermeneutical interpretations. This dimension is called sod, the hidden, mystical, or esoteric dimension. Sod expounds upon the philosophic, rather than legalistic, aspects of the Torah. It explains how people, places, and events in the Torah symbolically allude to spiritual concepts. Sod discusses the nature, as it were, of G‑d and His relationship to His creation, the origins and the purpose of creation in general and humans in particular, and how all of creation is a very precise, interrelated system. Sod offers an altogether different perspective than normally seen from a literal study of the text. This mystical wisdom is profoundly inspirational, but it is also a very complex system that is not easily mastered. Perforce, the Kabbalah must use many anthropomorphisms, which can easily be misunderstood by those not trained in Kabbalistic vocabulary and principles. In order to avoid distortions and misinterpretation, the study and teaching of sod was traditionally restricted to individuals of extraordinary piety who were steeped in the knowledge of the exoteric dimension, Talmud and halachah. To preserve its purity, the mystical tradition was mostly passed on orally from teacher to disciple. At the same time, however, the ancient mystical sources also taught that in ikvessa deMeshicha, the period preceding the Messianic era, specifically the 16th century onward, the sod-dimension of the Torah would become ever more revealed and accessible. Indeed, in the 16th century the teachings and writings of Rabbi Moshe Cordovero (the Ramak) and Rabbi Isaac Luria revolutionized the study of Jewish mysticism. These scholars and their disciples produced works that explained the Kabbalah in a well-ordered, systematic way. Moreover, they emphasized that the popularization of the Kabbalah is a prelude and prerequisite to the long-awaited Messianic era. Within this context, we can understand the origin and development of the Chassidic movement. Judaism is centered on the triad of G‑d, Torah, and the people of Israel. The Zohar, the basic text of Kabbalah, explains that these three are bound up together, and each has a revealed and hidden dimension. We know G‑d as He reveals himself to us within the workings of creation, what we may call the divine immanence in the world. Beyond that is the divine transcendence, which we may discuss on a theoretical level, but is ultimately beyond human grasp. As we discussed earlier, the Torah’s exoteric dimension, the way it was given and recorded in human terms and language, is a guide for human conduct. It is essentially a revelation of G‑d’s will relating to man. G‑d, however, is an absolute unity. Thus, G‑d and His will and wisdom are absolutely one, an indivisible unit. It follows that by understanding the deeper levels of Torah, we may come to understand G‑d on a deeper level. This status is not one of special privileges, but of special obligations—the dictates of the Torah relating to Jews are far more demanding than those relating to non-Jews. To that end, we were infused with a special soul, a nefesh Elokit, which is a spark of actual G‑dliness. Building on this foundation, the Baal Shem Tov’s teachings breathed new life into some of the most basic ideas in Judaism. What follows is a brief summary of some of them. G‑d created the world out of sheer nothingness, as related in the first chapter of the Torah. Everything came into being by the divine act of creation and is therefore totally dependent on the divine force that brings it about and sustains its existence. This divine source is the animating and sustaining soul of all existence, and if it were removed from any entity, that entity would cease existing, just as the presence of our soul is the very source of our life. G‑d permeates everything. In philosophical terms, this is called panentheism, which means that G‑d is in everything. This is not to be confused with heretical pantheism, which claims that G‑d and the world are one and the same. In the words of our sages, “G‑d is the place of the world, but the world is not the place of G‑d.” This means that G‑d is literally everywhere and in everything, “there is no place devoid of His presence,” but, at the same time, G‑d also transcends everything. Every object in this world contains a spark of divinity. To be sure, there are things that are regarded as evil or impure. These, too, contain holy sparks that allow them to exist for the purpose of giving us free choice. As G‑d states in the Torah, we must overcome and destroy evil and distance ourselves from that which is impure, even while pursuing and firmly establishing that which is good and pure. When we relate to the world around us according to G‑d’s directives in the Torah, goodness and purity become dominant. Negative, evil or impure objects and forces dissolve, as the holy sparks sustaining them are extracted and elevated by our actions. Following the Torah does not mean simply practicing the “do’s and don’ts.” To truly follow the Torah, one must delve deeply into the soul of the Torah, realize its divinity, and be inspired by its concealed layers. By means of the study and observance of Torah, we become, as it were, attached to the core and source of the Torah, which is G‑d Himself. In fact, Chassidism teaches that Torah study and mitzvot are the one and only way that the human can connect to G‑d and achieve his ultimate purpose: deveikut, attachment to G‑d. The principle of deveikut, the gripping awareness of, and attachment to, omnipresent G‑dliness, does not only apply to religious or ritual acts. The Baal Shem Tov emphasized the Biblical verse, “In all your ways, know Him.” This means that G‑d consciousness should permeate all we do, including the physical and mundane activities that are part and parcel of our earthly existence, such as eating, drinking, sleeping, walking, conducting business, and so forth. Finally, one of the Baal Shem Tov’s most powerful and pervasive teachings was his novel insight into hashgachah pratit, individualized divine providence extending to everything happening in the world. He explained that because all of creation is completely dependent on G‑d to constantly bring it into being, it follows that nothing happens by chance. Divine providence extends to even the slightest details on all levels of creation — human, animal, vegetable, and mineral. As the Chassidic masters would often say, not even a leaf falls from a tree without G‑d’s hand behind it. Today, Chassidic philosophy has permeated all spheres of Jewish thought, shaping our conception of G‑d and the universe. Thanks to the Baal Shem Tov and his successors, all Jews have access to the inner dimension of the Torah. May the era of Moshiach be upon us soon. Rabbi Schochet, z"l, read and greatly enjoyed my book The Light and Fire of the Baal Shem Tov, the only comprehensive book on the Besht in English. The way I understand this part is that it includes every and all human beings living in this generation and the unborn generations to come. Wisdom is a gift from Above that anybody can ask for through sincere prayer. Super intellect is not a must. Only a pure desire to attach to the Creator for the Creator's sake. Learn about the life and teachings of Rabbi Israel Baal Shem Tov, the 18th century mystic who permanently changed the Jewish landscape.